Addison Moore: EXPEL release date, March 22! Welcome to another Tuesday Tease!!! 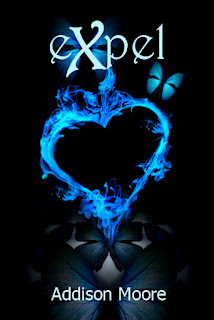 EXPEL will officially be released for sale on Thursday, March 22 for Kindle and Nook!!! I then wanted to release it next Tuesday, which is the 20th but horror of all horrors, I’ve actually agreed to do a radio interview. Me, the girl who doesn’t say more than ten words all day is going to try to speak for an hour. Rest assured, things will end badly. I may or may not put up a link after the fact. We shall see. Worse comes to worse I can just pick up EXPEL and start reading, God knows that will easily make sixty minutes evaporate into thin air. Of course, that would probably just be the first few chapters, EXPEL is one big puppy. That being said, there are only two more teasers for EXPEL so enjoy! “I was just thinking about you.” There is not one note of anger, or sarcasm in his tone as he settles his thoughtful gaze over me. Those hungry eyes burn for me, and it takes everything in me not to bow in his presence. I let him come to me with his lips, cover me with the hot of his mouth and indulge in a kiss that ignores the constraints of age and time—it spells out love and forever much better than any careless sentiment that I could ever utter. My stomach swims with the rhythm of his voice. I pull him in and share a deep kiss that has the power to ignite the two of us into a Molotov worthy explosion. There’s something more profound than lust here, something stronger than puppy love or infatuation. We sit for a small eternity fogging up the windows with the heat from our desire. I can't wait to get my hands on the book!!! I have already written in my planner the date of the book release and you can be guranteed I will be reading it shortly after! Good luck with the radio interview! Its time for the confidence to shine through that your not only an amazing author, but an amazing person too! People will see that! The Autumn Review - Thank you Autumn! I really can't wait to push it out of the door. I'm nervous though! I hope you'll like EXPEL! Been waiting it seems like forever! Withdrawal is so not fun. Betty - Yikes! It's coming! I'm so thrilled to finally get it out there. I hope you'll enjoy! Sam_Piano - Sam! That is awesome! You are so kind to have read my books. I'm so glad you're enjoying them! And I love that you're bouncing in your seat. I sort of am too just because I always feel better once I push a book out the door. And I totally get it about the kids, I'm a mommy taxi more than half the time. ;) I'm thankful you stumbled upon my books! Tamara Rose Blodgett - Hi Tamara! I was just telling my husband wow it's almost a year. I would love to do a post that reflects on all I've learned, the things I would do different and such. And it's so fun to see you on this journey, too!! It's been a wild ride, that's for sure! What was your final word count for Expel, how many pages? Sorry just curious. You keep saying it's one big puppy, so it got my curiosity going lol. Just wanted to let you know how wonderful I think this series is. I purchased your first book a while ago and was so glad there were more. I am now an avid (older, much older) connoisseur of your writing. I made sure I passed the word to all my friends who enjoy this genre. I am so excited to read Exple....what a great birthday present. Geri - First, happy almost birthday!!! Second, I'm so very thankful you found my books and enjoyed them. Also, I can't thank you enough for the word of mouth to your friends. I hope you'll like EXPEL. I can't wait to share it with you! Thank you so much for reading my series! I can't wait!!! I am so glad I stumbled across your books! When I first found them only the first three were out and ever since then I have bought them THE DAY they hit amazon! I hate when I finish them though cause I always want more! You are AMAZING!!! Mercedes Tucker - Thank you so much! I'm super glad you stumbled upon them as well!! I really hope you like EXPEL!!!! Okay just finished Exper I freakin can't believe the ending. OMG did not see that coming. But you left us hanging really bad. When does this stupid war start and end? ABuchner - Sorry to leave you hanging! The bulk of the war takes place in book 7. Thank you so very much for reading. I hope you'll enjoy the last leg of Skyla's journey. Oh my, i love these books. Happy i stumbled upon them. I just finished Expel, getting ready to download book number 7! How many pages were in Expel? RazorBlade Romace - So glad you're enjoying the books! As far as pages, on my word doc Expel is 604 pages. Amazon has it listed as 445 pages but they compress the files.